NOTE: THIS POST INCLUDES SPOILERS! CMT’s revised country music karaoke version of NBC’s “The Singing Bee” proved to be successful last season for the network. When the show debut on CMT last in June, it was the highest-rated series to debut on the network (with 1.5 million viewers). CMT doubled it’s order for the second season of the show, allowing “The Singing Bee” to film 20 fresh episodes. Fast-forward to today. For the last two weeks, “The Singing Bee” has been diligently fulfilling the networks order by shooting two episodes per shoot day. Their second season of filming ends this Sunday, November 22nd in Hollywood at their new stage (last season was shot at CBS Television City) on the “Hannah Montana” stage, Stage 9 at “Sunset Bronson Studios”. Reba will join Peterman this season for a cameo! No doubt, because of the show’s great success at CMT, nothing on the show has changed. Fantastic host, Melissa Peterman (“Reba”) returns to the karaoke stage with great energy. Peterman towers over contestants at about six-plus feet tall in stilettos which she wears a different pair each episode. But, proven to be a dangerous choice by the show’s wardrobe department when Peterman took a scary tumble off the stage while making her way to a contestant. Show contestants are cast after a round of auditions, but seated in the audience to give a random and spontaneous feel to the opening of the show when Peterman picks them each out of the crowd one-by-one by having them sing into her microphone until all six contestants are brought onto the stage. It was during this time that Peterman fell down between the stage and audience seating area. She gave everyone on-set quite a scare. But, luckily Peterman was perfectly fine. She called-out “Keep rolling, I’m okay”. That’s what I call a phenomenon host and disciplined performer. Taping was briefly halted to make sure she was really okay to proceed. Band leader, Steve Dorff (songwriter for Whitney Houston, Celine Dion, Kenny Loggins, among other greats) returns with “The Beehive Band” and includes some songs from 2009! Most songs are country, but there is an occasional sprinkle of a pop or rock song thrown-in. When watching this game show, it’s actually like two shows in one. Viewers are not only entertained by the game, but also a live band – one of the most amazing thing’s about the show. The band, and six singers must learn over 100 songs and be able to play each one on cue and in perfect synchronization! The game is played the same. Contestants can still win up to $10,000 and a “Singing Bee Trophy” if they beat-out all show contestants. Karaoke singers must sing their first lyric correctly to move past round one (“Pick Four”) . Round two (“Random Shuffle) contestants must place lyrics given to them on a big screen in the correct order. Round three (“Singing With the Enemy”) requires two players to trade off lyrics while filling-in missing lyrics from one song sung by a member of “The Beehive”. In the third round (“Karaoke Challenge”) singing contestants sing as if they are at real Karaoke and sing an entire song all the way through while looking at lyrics on a screen. Only difference is, they must fill-in fifteen missing lyrics which are worth 2 points each (for a maximum of 30 points). The next round (“Chorus Showdown”) involves the last two remaining players on the stage. The player with the highest score gets to chose to sing the given song or pass it to their opponent. Whomever gets the song’s chorus lyrics correct, goes on to the final round (“Final Countdown”) if their opponent misses their lyrics, and becomes “The Singing Bee Champion” winning the trophy and potentially up to $10,000. “The Singing Bee Champ” has the opprotunity to win money in this last round. Each song they sing the missing lyrics correctly, they receive $500. The contestant must get five out of seven given songs right to win the grand prize of $10,000. If they get three wrong, they do not win the $10,000. But, they do get to keep they money they won in that round along with the trophy. 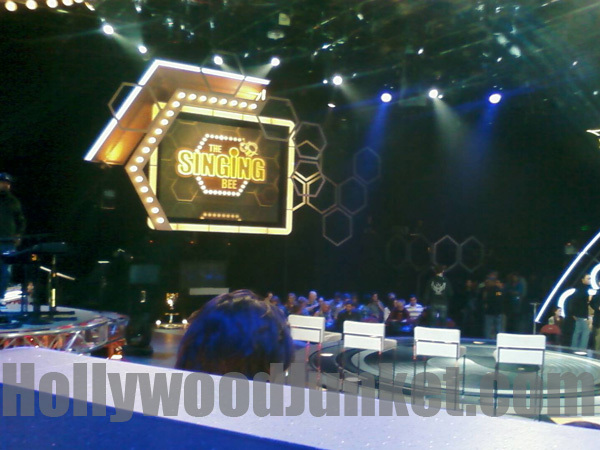 “Hannah Montana” stage is used for this season of CMT’s “The Singing Bee”. Keeping the rules fair on this particular game show is not an easy task. Several times throughout any given show, production has to pause to check a players lyric(s) to ensure that what they said does in fact match-up or not with correct songwriter’s lyric(s). In one incident, a player added-on an extra lyric at the end. But, all lyrics before that were correct. Game show “Standards and Practices” did what I thought would be the right thing, and gave the contestant her points. As long as all lyrics were in order and correct, the last added lyric was found to be irrelevant. However, contestants occasionally add an “and” onto the beginning of lyrics, but are buzzed off without given any points. At yesterdays taping, a contestant had to be removed from the show due to his affiliation with a member of the production staff. Many people may wonder how this wasn’t caught before the contestant show day. Most game shows hire a casting company to cast contestants with their own production staff that also cater to them while on set. So, apparently in this particular situation, someone on “The Singing Bee” staff looked up at the monitor backstage and realized that they knew this person right after the contestants introduction interviews! The show was stopped and everyone went backstage. A new contestant was brought back in his place. The contestant pulled also had some built-in fans in the audience. Apparently he has quite the following from “Monster Truck” shows? Which may be another factor as to why he was not allowed to compete. One thing that is new about this season – a very special guest will be featured in a comedy skit with host, Peterman. Fans will be excited to know that this guest is legendary country singer (and former co-star to Peterman) Reba McEntire! Reba was on “The Singing Bee” set on Thursday to film a comedy bit with Peterman in her dressing-room. They filmed the scene while the band and audience was sent on an hour and a half lunch break. More special guests were filmed for the show’s final episode Sunday. They include “Hooters” girls contestants and a special episode dedicated to an upcoming Fourth of July show with military contestants. Catch this familiar and proven favorite game show among CMT viewers with all new episodes staring this January 9th 2010! I absolutley love this show and hope it sticks around as a regular in CMT’s lineup. The Beehive Band is awesome. Please feature them more!!! Melissa is so funny and is perfect for the job! You have a winner with this one. Melissa Peterman is the PERFECT host for a show like this. Her stand up abilities and improv adds true character to the show and makes its truly exciting to watch. I laugh hysterically at her comments and love her dancing/singing!! I hope the show goes on for many more seasons…I’d love to get a chance to be on the show! Love the Beehive Band too!! !